We’ve practically been counting down the days until that disastrous and overdone Claudia Schiffer cover of Vogue Germany disappears from newsstands and the German fashion bible finally comes to our aid with the newly released October 2017 issue featuring yet another supermodel from the 90s. 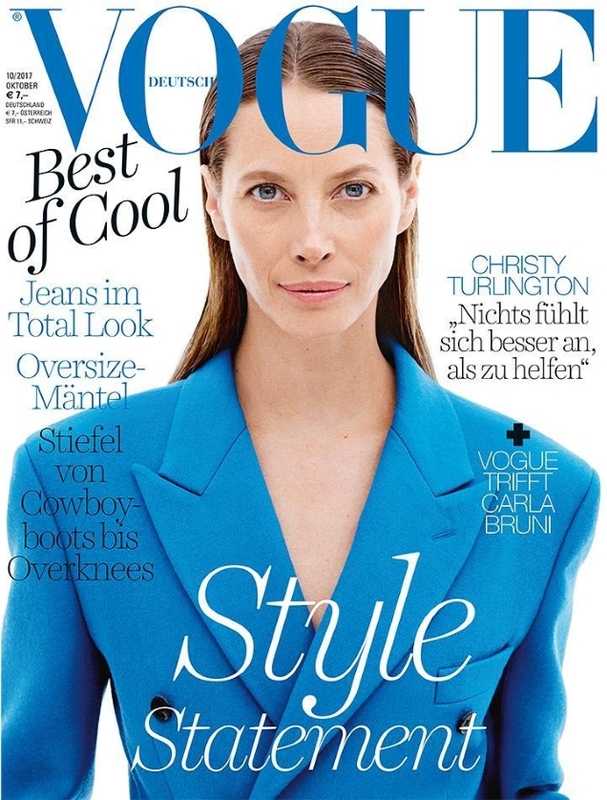 Photographer Daniel Jackson lets Christy Turlington’s natural, effortless beauty shine through with a bold, yet minimalist cover image of the model wearing a cobalt blue Calvin Klein blazer. Members of our forums were quick to discuss the cover. “Claudia last month, now Christy! They are on a roll!! The image is refreshing. Not much is going on. It’s a simple one, a much-needed cover nowadays. However, the layout is just tragic. The font is an eyesore,” pointed out MON the moment the cover struck. “All this cover needed was Christy, stripped back and pristine. The art direction is headache-inducing,” agreed zoom. “I like the retro vibe of styling and photography. I agree that the font is awful, it’s really ruining the layout,” noted kokobombon. “Beautiful, simple, but chic. And my God, this is the first time I see a major Vogue edition let a woman look her age, thank you for not airbrushing her into oblivion! She looks stunning!” admired forum member Miss Dalloway. The cover, however, failed to interest happycanadian. “I’m so confused. This is one of the worst photos I’ve EVER seen of Christy. And it’s not because she’s looking her age – I think she’s one of the most stunning women on the planet, and just as beautiful now as she ever was. But the lighting here is entirely unflattering, her mouth is awkward as hell, and what is that expression! ?” she asked. Are you feeling it? Await more from Christy’s cover story and join the conversation here.